Fargo Rents is a leasing agency with over 80 buildings available for housing, and the company continues to buy and build in the area as the market continues to grow. 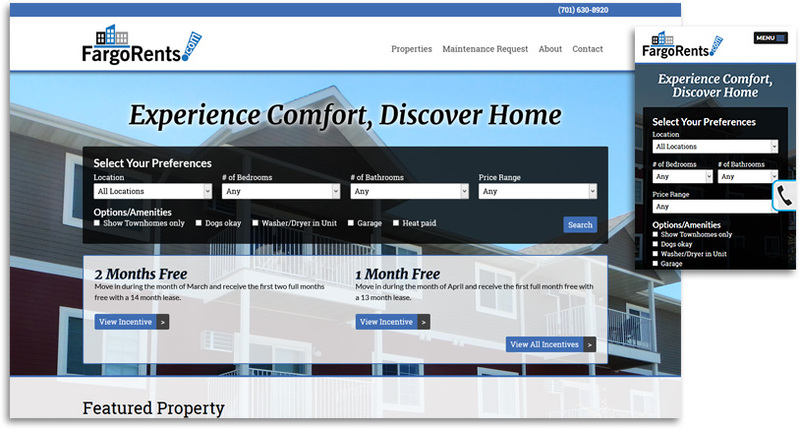 Fargo Rents was a current client with Ecliptic, and they provided us with a great opportunity to not only provide them with a striking new redesign, but to also implement a fully integrated version of Rental Maestro, a brand new, cloud-based property management web application. Rental Maestro allows Fargo Rents to easily upload and manage all of their properties, including adding and updating galleries, setting rental incentives, and accepting viewing requests, and it provides their clients with a robust search function.